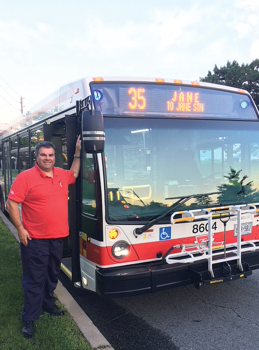 Toronto Catholic District School Board Trustee Sal Piccininni is a veteran driver of our very own TTC. Recently, when driving his bus one morning on Jane St., he spotted a lost 17-month-old little boy, running in his diaper along the busy thoroughfare. Piccininni knew the child was in danger of being run over by any one of the fast-moving cars. So he slowly maneuvered the large bus to buffer the child from oncoming vehicles. Once he had the child safe in his arms, he returned to the bus and called 911. He also called TTC headquarters to request another bus to pick up the passengers still on the bus. For the next 10 minutes, the passengers had a great time playing with the rescued child until the second bus arrived on the scene. After the passengers were safely on their way and with the bus empty, it was Piccininni’s turn to keep the child happy. In the meantime, the child’s mother had realized that her son had somehow opened the front door and was nowhere to be seen. She also called 911. The police arrived at the mother’s house and together they saw Piccininni’s bus not far down the road where the child had been brought to safety. Mother and child were reunited in a story ending on a happy note. As we all know from news reports, this is not always the case, so hats off to Mr. Piccininni. Some were saying that he was a hero. He was having none of that.